audie61 had the privilege to interact with both these gentleman and they both had given us sound advice and the true meaning of journalism. We reposts here the Malaysiakini article:- Five years ago – at our fifth anniversary – I paid tribute to Harun Rashid. A prolific writer and Malaysiakini columnist, Harun did not make it to our 2004 get-together. Also not with us tonight is SC Chan (right), better known in Malaysiakini as Tony Thien. Tony, who was our Kuching correspondent, had almost single-handedly helped ensure Sabah and Sarawak remain prominent in the frontpages of Malaysiakini. T o MGG and to Tony, both of you are sorely missed, and whereever you are, our thoughts are with you tonight. It’s now our turn to bear their torch. We must not, and cannot, fail them. It has been 10 tough, frustrating and yet exciting years. In the process, we have upset a lot of people. Where we were wrong, I apologise. Where we were right, we’re just doing our job. No hard feelings really – some of you are even here tonight. A decade ago, the few of us at Malaysiakini set about doing an unenviable task. Along the way, we gave Dr Mahathir Mohamad a pain in the neck. We gave Abdullah Ahmad Badawi’s spin-doctors a run for their money. Looking ahead, we intend to put Najib Abdul Razak’s 1Malaysia to the test. Indeed, our task is not done. As we close one chapter, we are opening another. This new page has yet to be written. We know not what story we are going to tell. But in Chapter Two, our mission will remain the same. It’s our job as journalists to hold politicians – be they government or the opposition – accountable to those who put them in power. We have done the easy part – putting Malaysiakini on the map. More difficult, however, was for Malaysiakini to be financially stable. Independent media needs independent financing – that has always been our unwritten motto. Malaysiakini today is one of the two news websites in the world – the other being Wall Street Journal – which have made the subscription model a success. It’s a feat which has gone relatively unnoticed. When the online editor of New York Times came to KL to speak to us about our business model, surely we must be doing something right. All this, thanks to the thousands of subscribers for forking out RM20 every month to access Malaysiakini. But as we grow, so too are our costs. Both subscription and advertising alone may not be able to sustain Malaysiakini. Which is why we cannot quite figure out how free websites elsewhere can survive. In the months to come, Malaysiakini will be leveraging on our content, our technology, our know-how, our 10 years of experience – and most of all, our passion – to venture into new areas. Our aim is to ensure that Malaysiakini can continue to grow to better serve Malaysians. After all, only by being financially independent can we be truly independent. And talking about mottos, allow me to share my own – this came from ‘Old Master’ Lao Tzu, a great Chinese philosopher. And so with Malaysiakini, it is not just reaching our destination that is important. It seems that 99.51 percent of Iban voters in the 9731 Baleh Constituency will see a challenge forthcoming during the next State elections. In the last state elections Dr.Masing (President of Party Rakyat Sarawak) was challenged by Lucius Jimbun using the SNAP symbol but he truomphed quite easily. The likes of strong man and party Presidents Tan Sri Koh Tsu Koon( news flash:- A big surprise! Penang State Chief Minister has LOST!) and Sammy Vellu were soundly defeated in the 308 elections and James will be very wary of the threat that will be posed this time round from PKR. The divisional chief of PKR Ulu Rejang Frankie Bendindang is speculated to give James a “good fight” and touted to be the candidate favoured by PKR. However the voters of Baleh thinks otherwise according to a survey conducted by Natasha and Joey of audie61 and team. The results indicate that the voters are in favour of another candidate who gave the BN a lot of sleepless nights in the last 308 elections.It was found out that he losts the lasts parliamentary seat as BN had the full machinery and also only the ENEMY FROM WITHIN his own camp derailed his path to Parliament. He was an independant candidate then but if he is a PKR candidate surely Baleh will be an EXPLOSIVE SEAT. According to a veteran voter and a local from Baleh in 1983 when James stepped in the world of politics he brought GOOD and BIG Hopes for the Ibans in Baleh. Dr.James is afterall a doctor of Philosophy and he graduated from the Australian National University Canberra. He also served as a senior research officer with SESCO(Sarawak Electricity Supply Corporation) He has all the credentials to be helping and assisting all his fellow Ibans in the area. Has he done sufficiently enough after two and half decades as Assemblyman for the area? He has all the facilities within his reach and if he has done enough there would not be any more rumblings and disgruntled Ibans would they? This is what James envisage in his vision for the 2006 elections. If he is relected he will bring more infrastructure development and land development for large scale farming and plantations in Baleh. He will ensure all schools in the area are supplied by electricity as part of the plan to equip the schools with the necessary infrastructure and facilities to facilitate the promotion of the information and communications technology.As for roads,James said the first phase of the proposed 37 Km Kapit-Nanga Mujong-Baleh-Nanga Gat Road would be completed by 2007 while the second phase was due for completion by 2010. Baleh being one of the remotest and biggest rural state constituencies James has done sufficently enough to stay in power for the last two and half decades but they are still many oppostion voices harping on his failures to deliver as promised. WHAT WAS PROMISED..?? WAS IT THE CHIEF MINISTERS SEAT.Hmmm.?? This is the very question now being asked in Baleh,’What other hopes has James to deliver to the Ibans in Baleh. ?” Will James be able to withstand the next challenge? Will they be tears flowing or champagne to reach his third decade? This audie61 picked up from an internet blog,”I suspect that in the subconscious psyche of many Sarawakians, they do not believe that opposition parties can defeat the BN in the state general election. Will PKR stop the champagne flow for James as he looks forward to three decades of being a State Assemblyman or will this be a hurdle too far for James? We shall monitor N56 with interests and for now we shall leave it to the people of Baleh to see who is mosts suited to represent them in the State legislative Assembly. An SUPP Pemanca said to audie61,” What Gag orders ?? They are treating us like Kids. We have sweated and toiled for SUPP all these years and used all our own dollars and cents and they think we are still children.” Hmmm very strong words from one who has seen good times and difficult times with SUPP even through the opposition days. Don’t ever for once take us lightly and it is us who are the main players in SUPP and not the Ministers,Assstant Ministers and those who think they can wield their influence. I’m absolutedly ashamed of the “DUDONG signboard fiasco and its a real slap in the face of veteran SUPP members. Even PRS at its height of infighting or UMNO Protem Signboard no one dared to take it down. He went on and said,” Isn’t it a slap at one’s face as whoever directed it to take it down forgot to look at the mirror.” This is not only about Team A or team B and if it spills over and sees that SUPP is in bad shape good he said. We will rise like a PHOENIX. The late President Stephan Yong would have put his foot down earlier and George Chan should have stepped in so much faster and now its a little too late to repair the damages done. What would you give SUPP chances in the next state elections? He even went on to say and remind Wong Soon koh how his uncle Wong Soon Kai had tears in his eyes when his nephew a headmaster decided to step into the world of politics. Has he forgotten what are his ideals when he joined SUPP? Does he need to be reminded? audie61 was invited to sit down for this lunch date and it came as a surprise from someone who loves SUPP so much and today seeing his beloved party in such a shameless state and the direction it is taking is not a step forward but three steps backwards. Don’t you think that the younger set of voters has had enough of SUPP and they will surely turn to DAP to fight for their rights. SUPP is only interested in fighting their own wars and have really forgotten their REAL SENSE OF BEING POLITICIANS. It must be noted that most people join politics to try to better their own environment and a better grasps of individualistic aspirations. There must be a love for the party ,instinct for political survival and a joy of working in that environment. These must not be detached or else the ideals and central principles of a political life is just ZERO. It seems most SUPP members are so enbroiled in protecting their own camps or castles that they have forgotten their real tasks at hand. A compromise solution is good but there must be tabled to the whole SUPP members on the parties direction and its course of actions. No use to talk and next day they are all at each others throats again. Its just plain nonsensical and the elder and veteran SUPP members has had enough up to their necks and some got themeslves in deep holes going for second mortgages to keep SUPP afloat.Have they forgotten? Did audie61 get himself in a tight situation? 25 years ago I signed on the dotted line to be a member on the shuttle flight between Singapore/KL but I eventually ended up being very active in the football arena instead. Those days SUPP was the party for the people in Sarawak and many just love the thought of being a member of SUPP. Its a bit similar to the football scene even if one was being paid a $100 to watch Sarawak some would just take the $ but end up going to the movies. SUPP is finding it hard to be the party people love and its all due to the leaders self interests and lacklustre attitude and completedly losing the plot of political ideals. So the pages of Team A,Team B, Dudong branch fiasco will see a bitter end an a winner takes all as it is a clear fact that Soon Koh has his eyes set on the Presidents Chair and so has David Teng. Will the SG Senator Sim be the spoiler and Peter Chin might just walked in put his hands on both the arm rests of the Presidents Chair. Joey received an sms,’Is any political problem unsolvable..?” Read the article in Malaysiakini and in it the Prime Minister Najib has instructed/mandate given to his deputy Muhyddin to tackle the issue and come up with a solution.” Wow! Goodness me! MCA can’t solved their own problems and it seems only interference and assistance from a Third party will see that this problem does not drag on. Deputy Prime Minister Muhyiddin Yassin said he is giving himself one week to find a solution to the MCA leadership crisis. He said a formula would be drawn up during that period to reach a consensus among the disputing party leaders. He said a series of meetings had been held with several party leaders to discuss the crisis in greater detail. “The task is not easy because it involves the interest of the party as well as that of the nation,” he told reporters. He said he was given the mandate by Prime Minister Najib Abdul Razak to tackle the problem by implementing pro-active measures as soon as possible to prevent the crisis from becoming worse. “I’ve held a series of discussion, not with everyone, but certain individuals and I will continue with the discussion, if possible before the prime minister returns home (from abroad). “At the same time, I’ll continue to accept suggestions from the Chinese community leaders who have also voiced their opinion and observation on the crisis,” he said. The deputy premier’s remark comes five days ahead of the extraordinary general meeting (EGM) proposed by the faction aligned to vice-president Liow Tiong Lai. Liow and his supporters have vowed to call off the EGM if the rival faction, headed by president Ong Tee Keat and his deputy Dr Chua Soi Lek, agree to holding fresh party elections next month. Although conceding that a fresh elections is the best panacea for the impasse, Chua however wants the contest to be held next March while Ong has remained vague on this. Meanwhile, Muhyiddin said the crisis must be tackled in the best manner possible to arrive at a ‘win-win’ situation for everyone concerned. Commenting on the measures to be taken, the Barisan Nasional deputy chairperson, said he had no intention of disclosing any condition or strategy until the settlement formula had been achieved. “In the initial stage, we don’t want to set any condition. I feel the important thing is that they feel the measures that would be taken are aimed at resolving the problem and I feel, it has become a public secret, not a party secret any more. Everyone knows about it. “What is important is that at this stage, I will not set any condition. What is certain is that when it comes to a particular stage, there is an agreement in principle. So, we want them to uphold the decision with the objective of reaching a settlement,” he said. He said the matter would not be announced to the public, including the media for as long as the objective had not be achieved. “At this stage, it’s okay because it is still at the initial stage but subsequent measures would be disclosed when everyone have reached a consensus on what needs to be done,” he said. Asked on Najib’s suggestion that a fresh election be held by the MCA to resolve the conflict. Muhyiddin said that was the view of the prime minister which he was working on. “I was instructed to adopt this approach, but I will find a way of getting the consensus of the MCA leaders. Chief Minister Political Secretary, Abu Seman Jahwie is the one and only ordinary member of Pesaka Bumiputera Bersatu (PBB) serving as an Elected Member of Sarawak State Legislative Assembly and holding important position in party HQ. Abu Seman hailed from Kampung Hilir Bawang, Matu, graduated with Bachelor of Economics from Universiti Kebangsaan Malaysia (UKM) and was also the former Senior Assistant Director of Customs for 23 years before joining in politics. Presently, he is the Assistant Secretary-General of Parti Pesaka Bumiputera Bersatu (PBB) Sarawak and was once the Assistant Branch Head for PBB N.38, Jemoreng. 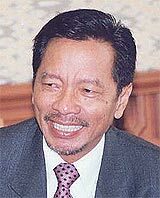 Elected as N.38, Jemoreng state assemblyman since May, 20, 2006. The most widely publicised Jemoreng representative, however, was missing from the news and group photograph when it matters most. Seman used to be deputy branch chief to Datuk Abdul Wahab Dollah at PBB Jemoreng set up but was ironically not attending the branch TGM held at Kingwood Resort recently. His place is now taken by Nawarwi Rabani, a local businessman while Wahab was returned uncontested. It is widely known that Seman is very close with the Awang clans lead by the three musketeers, Datuk Awang Tengah Ali Hassan, Datuk Seri Mohd Asfia Awang Nassar and Awang Bujang Awang Antek. Seman is PBB deputy secretary general at HQ level despite being what Taib describe as “First Termer”. Whereas the low profile Wahab whom is serving as Igan MP now is known as a lone ranger that recently was being seen friendly to the Awang rival, the Abang gang. The fight between Tengah and Asfia with Wahab had been taking place long long long time ago, and is an open secret, that only PBB president Pehin Seri Abdul Taib Mahmud could “try” to mediate. Sources very close to Demak Jaya revealed that recently Asfia and Seman met Taib, trying to seek favour. Unfortunately, being a fair father to all, Taib told Seman to attend the TGM organised by Wahab. Seman however did not. A letter was also issued requesting for the postponement of the TGM, but it was not taken seriously because the directive does quote “President” decree. It was not immediately known whether the Awang gang will make fuss over the issue and turn PBB into another chaotic member of Barisan Nasional (BN) joining the likes of Sarawak National Party, Parti Bansa Dayak Sarawak (PBDS) and most recently Dudong Not Very United People Party, ooops Sarawak United People Party (SUPP). The noise over interference from PBB headquarters at branch meeting are ruling coffee shop and sms are showering Sarawak Update including those originating from Sarawak corridor of powers. To date, three popular youth chief have lost while many incumbent deputy branch chairman are being replaced in proxy wars as party TGM are by and large, game of numbers. MCA Women’s wing chief Chew Mei Fun and Youth wing chief Wee Ka Siong made tearful appeals for delegates to turn up at the Nov 28 extraordinary general meeting to press for fresh party polls. During a press conference shortly after being dropped from the party’s party presidential council, the duo, in between tears, said that a strong showing at the EGM was vital to restore democracy in the party. The dramatic press conference began with vice-president Liow Tiong Lai stating that the group’s “heart bled” following the axing of nine individuals from the council. “MCA is a family at war and is presently engaged in the politics of slash and burn… it has disowned the Youth and Women’s wing chiefs. This is a serious matter and it has broken the camel’s back,” said Liow. He said party president Ong Tee Keat had replaced the dropped presidential council members with his own men. He claimed that Ong had axed detractors in order to have “absolute power”. He then urged party delegates to “rise up” and attend the EGM in full force to pass the resolutions. Liow, looking stern but composed, did not cry during the press conference. Earlier today the party’s central committee voted to object the EGM called by Liow’s faction. Also SPDP plans to go National and what an opportunity for the MCA rebels who will obviously sooner rather than later be sent to a very “FREEZING COLD ROOM” Is there any room for them in SPDP..?? This will erase another headache from Najib and the cabinet. The MCA central committee headed by party president Ong Tee Keat today rejected the call made by a minority group in the CC for an extraordinary general meeting on Nov 28. The central committee said the proposed EGM and its resolutions calling for a fresh party polls were defective and against the party constitution. The decision to reject the EGM was made after the matter was put to a vote in which 23 voted against the EGM, 10 supported it and two abstained. The EGM was mooted by a faction backing vice-president Liow Tiong Lai. They are opposed to the greater unity plan undertaken by Ong and his rival-turned-ally Dr Chui Soi Lek. The CC meeting also decided to revamp the powerful presidential council, resulting in Liow loyalists Youth chief Wee Ka Siong and Women’s wing chief Chew Mei Fun being dropped. They were replaced by Ong and Chua’s backers. In an immediate reaction, Liow said that he was unhappy with the party’s decision to remove his supporters from the presidential council. So SPDP be ready to open up your doors for these MCA Ministers plus Deputy Ministers and you will be a major player in the country too. It is something really worth considering as the political climate is so fluid at the moment. What gag order that James Masing has ordered to his PRS army will not deter SUPP from having a go at PRS says a Professor with a Local University. Very simple,Taib has not forgotten how Masing has backstabbed and had the open confrontation with him during the height of the Dayakism era. This is the opportune time to use SUPP to have a right go at James. Its PRS who started the fight and the SUPP towkays are not exactly very happy and they will use their hatchet man to bleed PRS dry. Excuse me for using such harsh words as someone needs to shake and rattle PRS as they seem to have forgotten where the $$$$$$ came from to start the party. Short memory and this will surely see to a demise. SUPP has nothing to fear as what they have asks for on the additional Assistant Ministership has fallen on deaf ears. Time to pick a hole or two on PRS and show to CM Taib that SUPP is still relevant and not the punching bag for DAP. Even Affendi Jeman who now wears two caps and has lost some credibility being protem Chairman of ARBS and JPUNS says that they will assist SUPP in whatever ways possible to ensure that losts seats are won back by the BN coalition. CM Taib is very aware that at any time PRS as a party minus a few CM loyalists Yang Berhormats might leave the coalition at the eleventh hour before the state elections. It has happened before an PBS(Party Bersatu Sabah) has done it. The KM1 and KM2 has failed but a yardstick could be how Lim Kit Siang failed in Penang and today who is the CM of Penang. Does audie 61 need to write it out and spell it out here. James is really under the wings of CM Taib and soon he will try to find a gap to manouvere and the timing is vital to succeed. He needs to win back his dignity and as one PBB Senior member said James was a new breed of special politician when he first appeared on the scene. Somehow he has losts his way and out when the struggles that he steadfastly held in his palm and next to his chests. History will rewrite itself and James has of course that ambition and his able lieutenants has even met up with opposition leaders on number of occasion before 916. Who doesn’t want to be Chief Minister of Sarawak..? Don’t you if given that chance..? Seriously,if not you should not be reading any more political blogs and just read entertainment news…hmmm. PRS on coalition with SUPP. No surprises here as PRS leaders are not exactly sharing the same ideals and respect for each other. Even a SC member of PRS once said to me openly,’SUPP should look over their shoulders as PRS has equal number of legislators in the State” Don’t over exploit the situation and PRS with so many former PBDS legislators will not give in so easily and for that matter bullied by SUPP. I was taken aback and I realise that with enough support and power there is nothing that PRS fears. CM has seen that very clearly and that is why he uses Larry Sng (partyless Assistant Minister) to the maximum. Wouldn’t James if he was the CM of Sarawak use this tactic of DIVIDE AND RULE. He has learnt from the bests and he will surely unleash all that he has kept in his heart and strengthen his position. PRS has already done her housekeeping and there are only a few loose ends to tighten the noose around SOME NECKS and James will just push his finger and the automatic lieutenants will give their all. There is no point anymore for James and his troops to go underground but to fight the war on a level playing field and attack the coalition partners without FEAR and taking out the hatchet man in the respective parties. There are too many HIDDEN HANDS involved in this battle and PRS will know whatever they do they have already been booby trapped.